"If there must be only one, this is it, ribbon fans." "When viewing the magnificent floral forms that Candace Kling creates, it's sometimes hard to believe that they are actually pleated, gathered, ruched, and twisted ribbons--not the real thing. Her gorgeous ribbon flowers appear to be extremely intricate and complicated, but her extensive directions and diagrams take the mystery out of recreating everything from roses to pansies to poppies to daffodils. After nearly two decades of researching antique ribbon work, her knowledge of vintage pieces is evident in much of her work and in her finely tuned sense of color. 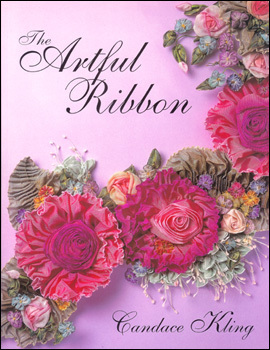 The many photos of vintage ribbon-work flowers, not to mention those of her own artistry, are themselves worth the price of the book. " "In years past, ladies' bonnets and other accessories were adorned with delicate flowers made from silk ribbon. With the decline in popularity of fancy trimmings, the art of making these flowers was almost lost. However, here is everything the ribbon-flower crafter needs to know about using modern materials in an old-fashioned way. Full-color photographs and diagrams describe materials, techniques, and finished products. Many products of collector's items from the 1920s as well as modern examples are included."